Home Singapore Singapore Formula One Night Race Is Over? Look at what we have done for Singapore … Yes, the Grand Prix has cost Singapore a lot of money, but we’ve also given them a lot of money. Singapore was suddenly more than just an airport to fly to or from somewhere. Now they believe they have reached their goal and they do not want a Grand Prix anymore. Speculation over the end of the night race in the Lion City has been rife since the numbers from this year’s edition of the race were released. Race promoter Singapore GP (SGP) revealed in September that the daily attendance this year was pegged at 73,000, with the three-day total at 219,000 people. The overall ticket take-up was 15 percent lower than the average attendance since 2008. In comparison, post-global financial crisis in 2009, the event saw crowds of just under 80,000, with close to 240,000 tickets sold for the three-day event. In a 2013 report, the cost of organising each Formula One race was estimated to be about S$150 million (US$105 million). The possibility of Singapore dropping the Formula One night race from its annual calendar has been raised amidst ongoing negotiations to extend the race’s tenure when its five-year deal expires in 2017. Chief executive of the Formula One Group Bernie Ecclestone raised the prospect in an interview with German magazine Auto Motor Und Sport published on 20 November. Ecclestone said that the F1 Singapore Grand Prix may not continue beyond 2017, claiming that Singapore is not going to extend the deal. Speaking to Campaign Asia-Pacific, Zayn Khan, Southeast Asia CEO at Dragon Rouge, noted that the Singapore government’s reservations about committing to another F1 contract period were understandable. “Amidst uncertain economic times, especially with declining attendance numbers and increasing costs associated with hosting this international event, the immediate ROI argument is questionable,” he said. 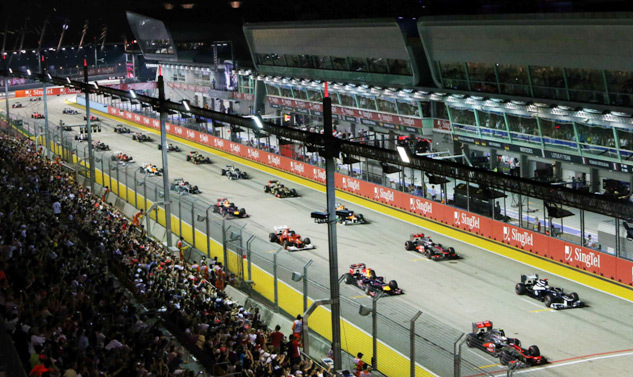 Disruption and perception However, F1’s impact on Singapore is undeniable, with Dan Parr, director of Fast Track Asia, a part of CSM Sport & Entertainment, pointing out that it is one of the flagship F1 events and has become far more than a car race. “Singapore has set the standard to which all other cities now strive to reach,” he said. “There are more people that travel to the Singapore Grand Prix for the music than for the car racing so it’s much bigger than just the F1.” Parr added that while there is no doubt that it is expensive and disruptive, it has also fundamentally changed perceptions of Singapore and arguably driven the Lion City’s sports tourism strategy. “For a few days a year Singapore is cool, funky and glamorous, challenging the perception of a rather sanitised, dull city,” he said. “It also provides F1 with an amazing showcase in the critical Asia market.” Read Campaign Asia-Pacific’s 2014 interview with Bernie Ecclestone on F1’s future in Asia Parr believes that neither Singapore nor Formula One Management want to drop the race, and that he will “be amazed” if it comes off the calendar. “Most of this discussion is good old fashioned sabre-rattling and negotiating tactics,” he argued. Khan agreed with Parr that the race helps promote a “more audacious, dynamic and cosmopolitan” image of the city-state, adding that “Singapore needs F1 as much as F1 needs Singapore”. He recalled that it certainly created some ripples among the organisers of Malaysia’s Sepang Grand Prix when the race was first announced. In the long-term, continued investment in F1 is a sound way to ensure that Singapore will continue to build its reputation as a global brand. “Discontinuing F1 sends out the message that Singapore was never really that visionary and that it looked at F1 purely as a business transaction which has run its course,” Khan said. “Is this what we want the world to think? To assume that Singapore has ‘arrived’ and no longer needs to invest in major events like F1 is short-sighted, and I am not convinced that is the view of the government anyway. “If one takes a long-term nation-branding view, then continuing to invest in F1 is a sound way to ensure that Singapore will continue to build its reputation as a global brand. To assume that Singapore has ‘arrived’ and no longer needs to invest in major events like F1 is shortsighted and I am not convinced that is the view of the government anyway.” No material impact In the event the decision is made to drop the F1 night race, what then? Parr believes that the Singapore tourism market has evolved and grown to be far more than just the F1 these days. “Losing the event would obviously be a huge shame, and there are several thousand people from around the world who make the trip to Singapore each year for the GP, but against the millions who visit throughout the year, it’s not going to make a material impact,” he said. Previous articleWhat do you Think of Indonesian People?